Nice compact flowering shrub. 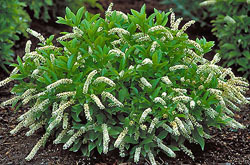 Displays white, fragrant flowers in the spring. Beautiful evergreen foliage emerges with bronze tints and matures to deep green. 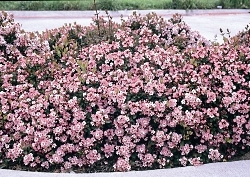 Can be used as a low hedge or foundation planting. Also would be great in containers. 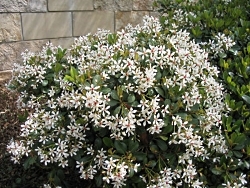 'Spring Sonata' offers dense glossy foliage with an abundance of white flowers in the spring. 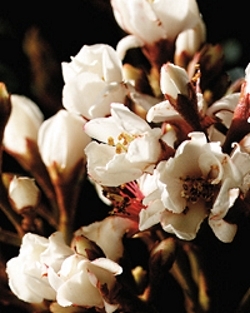 This variety of hawthorn blooms two to three weeks later than the other varieties extending the bloom season. In fall and winter, dark purple fruit cover the plant. 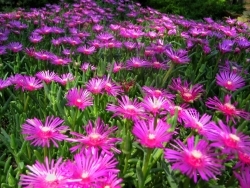 Use in foundation plantings, mixed borders, or in containers. Great choice for the beach because it tolerates salt spray.